Home Commentary Who’s Pushing Everyone In? When I switched my college major from engineering to clinical psychology, I was fortunate to have a new next-door neighbor, Al, who was a graduate student in clinical psychology. He was in the final months of an eleven-year saga to his PhD. One day I asked him what the difference was between a psychologist and a psychiatrist. To my surprise he didn’t go into the differences in their education, or the focus of the practices, or any of the obvious distinctions. He took a very different approach. He told me a joke, and here it is. A psychiatrist and psychologist were good friends. They had been for many years. 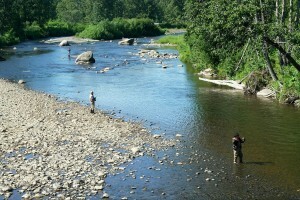 They also both loved fly fishing, and often spent time together fishing on the banks of their favorite streams. On one such outing, after spending a couple of hours fishing, they noticed that someone was coming down the middle of the river drowning. They quickly removed their shoes and wallets, and swam out to save the man. Fortunately, they got to him in time, and were able to revive him. Once they were sure he was going to be fine, they sent him on his way and went back to fishing. A few minutes later, they saw a woman floating down the stream drowning. They immediately sprang into action. They swam out and rescued her, brought her back, revived her, and sent her on her way. Then they went back to fishing again. Not 10 minutes later, yet a third person came floating down the river drowning. The psychiatrist was up to his waist in the water before he realized that his friend was not beside him. Looking over his shoulder, he saw the psychologist walking up the bank of the stream. “Hey, aren’t you going to help me save this guy?” he shouted at his friend. Al then explained to me how the story answered my question, and I was quite satisfied. However, as with many things I learned from him, this one taught me a lot more over the remainder of my life than was at first obvious. Today this has become one of the most important lessons of my life, because it has shown me, in crystal clear terms, the difference between rescuing people from problems, and eliminating the problems themselves. Both have their place, of that there can be little doubt. The trouble is that it seems much harder to prevent problems than to fix their consequences. At least that’s the way it appears to someone who doesn’t understand the nature of the problems and how they came to be there. Once that knowledge is available, it is child’s play to prevent virtually any kind of problem. But until that understanding is present, it will always seem easier to just limit the damage after the fact. So our world is filled with groups of people who have taken it upon themselves to address the awful consequences of any number of problems. There seem no practical limits to the range and scope of tragedies, nor is there a limit to the kinds of people who want to help provide aid and comfort to the victims. On the other hand, virtually no one seems to have the least interest in doing anything to prevent the problems from happening in the first place. Oh, some say they do, but one look at their idea of what will accomplish that shows just how little they really understand about what they are trying to prevent. For instance, many people are sincerely and vehemently involved in “anti-war” actions of one kind or another. They have no idea whatsoever that simply by taking the position of hating war, they bind themselves to it. There is no recognition at all that the way to eliminate war is not by hating it, but by loving and promoting peace. It simply makes no sense to them. The same applies to those who are “fighting” one kind of disease or another. They are so focused on the disease that they never even consider being pro-health, rather than anti-disease. My own mother died of cancer that started in her breasts and eventually metastasized into her bones. No one can accuse me of not being “sensitive” to the plight of “cancer victims.” But I would no more join the “fight against breast cancer” than I would throw a gallon of gasoline on a fire in my living room to put it out. What I would do is anything I can that will promote the free and unresisted expression of authentic self-hood in all people. It was the lack of that from which my mother suffered, that was eventually expressed as cancer, and that finally killed her in a most painful, humiliating, and horrible way. Have I saved any lives? I don’t know. But I feel pretty sure that I have at least not added to the casualty list by refusing to join the crowds of protesters. Am I saying that no one should ever rescue a drowning man? Absolutely not. What kind of stone heart would it take to sit by passively and watch someone drowning who could be saved? But how can someone sit by quietly watching thousands upon thousands of people dying of wars and disease and all manner of pestilence and do nothing that has any chance of preventing those things? Yet humans today do precisely that by the billions on a daily basis, and no one seems to even notice. So the answer is not which approach is right or wrong. The only sane answer is to do both at the same time. The folly is to do either exclusively, which is precisely the way it has always been done: rescue the victim, and let the true causes proliferate unobstructed. I have nothing whatsoever against the causes of feeding children, or removing mine fields, or any of the countless other causes we hear about every day. But it is to me an outrage that I virtually never hear about anything being done on such a scale that offers any real chance of changing the minds of men and women in such a way that these unfortunate conditions die off of neglect and lack of interest. There are reasons why it is so difficult to make such changes. The main reason is that from war to illness to starvation, all problems are created and sustained by the ways in which the principle players in the dramas think. And those thoughts are formed and guided by their beliefs, which are in turn derived from some kind of cultural tradition. most commonly religious in nature. People do not give up those kinds of centuries-long traditions easily. It is almost always a multi-generational process even when it’s highly motivated and in the fast lane. If we were really serious about elimination of these tragedies–you know, the ones everyone looks at, shaking their heads sadly and asks, “Why?” without waiting for a answer–if we really meant it, we’d be pursuing answers to the questions that at least could provide answers (click here for more). So go ahead. Send your money to Save the Children. Salve your conscience (if you think it really will). And try to ignore the incontrovertible fact on April 15th, when you sign that other check, that it is your money that is being used to bomb children who never did you any harm. And that calling them “acceptable casualties” or “collateral damage” doesn’t change a damn thing. Al Gore thinks he’s got an “Inconvenient Truth” with global warming. And he probably does. But the real inconvenient truth is a lot closer to home than that. And it’s not decades or centuries away. The real and far more inconvenient truth is right here, right now, right in your own heart and mind: Are you going to keep feeding the problems and saving the “victims?” Or are you going to make sure that someone goes upstream, if not yourself, to see who’s pushing everyone in and do something to put a stop to it? Regardless of what you choose, at least have the integrity to own the choice and its full consequences.